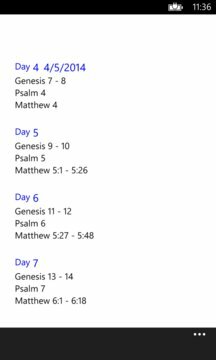 The complete Catholic Bible broken into 365 daily modules to help you read it over the course of a year or to provide a quick daily reading. It keeps track of which daily modules you have read, showing the most recent ones on the opening screen. 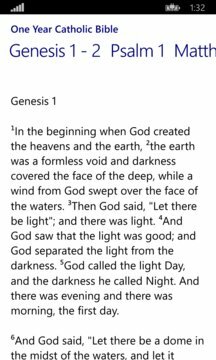 Each daily module has three readings; two from the Old Testament and one from the New Testament to provide some variety each day. All books are included including the deuterocanonical books. If you have a Windows 8.1 PC or tablet, please check out the same app in the Windows Store. Your last reading from your Windows 8.1 Phone will sync with your last reading from your Windows 8.1 PC/Tablet and vice-versa (note that the individual dates for each reading are specific to a device, but you can track your progress across devices).